But—for now, there are still a few more inches needed to finish the back. I love the way the skiens blend one into another—There must be a 'repeat'--but it hasn't shown up yet! 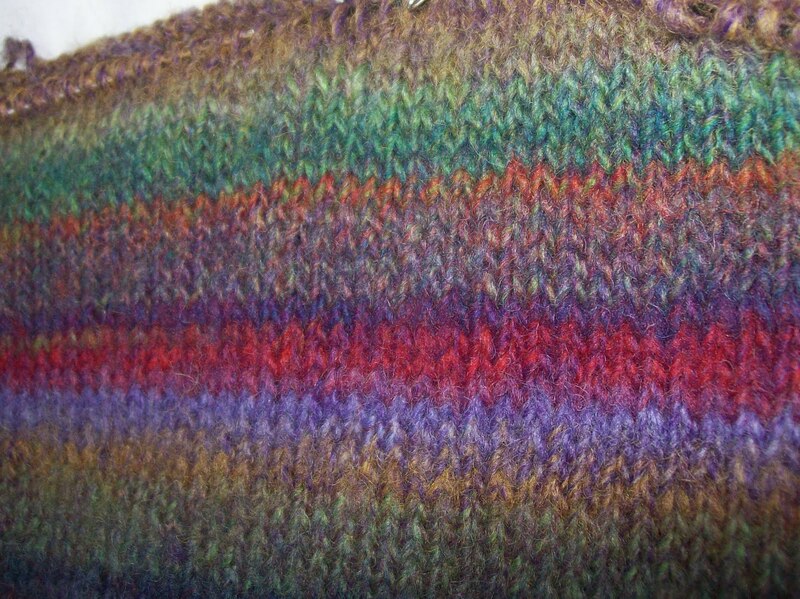 Look at the lovely changes--some where in this image--there is a change of skeins--but it's invisible! At the same time, the pieces were re oriented—now both fronts are on one needle, and both backs are on another. 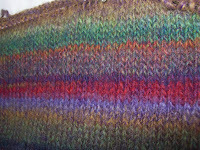 Not quite 6 inches (of at least 10—more likely 12 inchesz) of the back have been knit—and a few short rows have been added to refine the shape of the back. Make that over 7 inches –since I continued knitting last night –after I started the draft of this post! At the same time serious inroads have been made into skeins 5 and 6—making me very glad that skeins 7 and 8 are in the waiting! I think I'll be able to finish the body of the shrug with skeins 5 and 6—but the entire edge of the shrug will be finished with ribbing (I am think a few inches!) and that will be a lot of stitches/ribbing! The ribbing will be a full band all round the shrug—and drawing the neck edge, and hem in, as well as adding depth to the front. 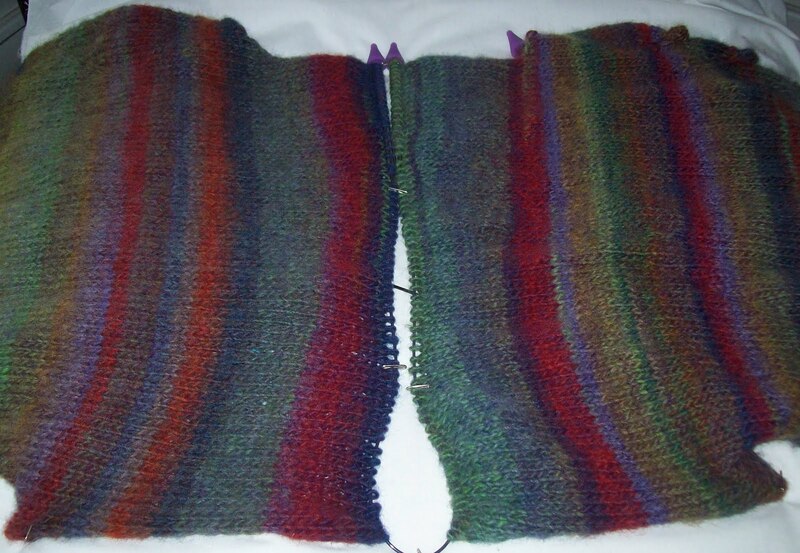 There will likely be some short rows involved too—to make a bit of stand for the back of the neck that will let the ribbing fold over as a collar. So far? —Knock wood—it's all working out as I hoped--actually better than I hoped. I love the colors and I love how well they blend and work together. I am usually pleased with the value that Lion Brand Yarns offer--but yarn is well named--It is Amazing! I am loving the colours! And your process is fascinating. Very fun project!